Welcome to Leadership Impact – the podcast for modern executives reinventing leadership. 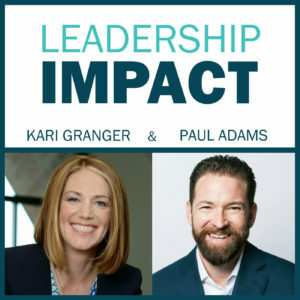 Hosted by executive leadership coach and CEO of The Granger Network, Kari Granger, and Sound Financial Group CEO, Paul Adams, this podcast aims to address the topics of performance and leadership through real life examples. In this episode, Kari details what motivated her to start the Leadership Impact podcast. Her goals for this podcast include giving listeners a new perspective and practical tools they can put into practice immediately. Kari introduces her co-host, Paul Adams, and explains why she chose to ask Paul to join her in this endeavor. No man, or woman for that matter, is an island. In that spirit, Kari believes that in order to truly make a leadership impact, you have to embrace that everything is a co-creation. Finally, Kari and Paul stress the importance of putting into practice the leadership lessons learned on this podcast. If you are looking to make an impact or learn a nuanced style of leadership, then this is the show for you. In Season 0, we’ll cover four main topics: performance, momentum, new futures, and coordinating with precision.